Winning Premier Breeder at this year’s Royal Agricultural Winter Fair and the Highest Flock Improvement Award for Ontario Sheep Farmers means “we are on the right track” says Keith Todd, owner of Todd Sheep Company with his father, Hugh Todd. Just back from the Royal with more than a few banners and ribbons, father and son took me on a tour of their sheep farm near Lucknow. 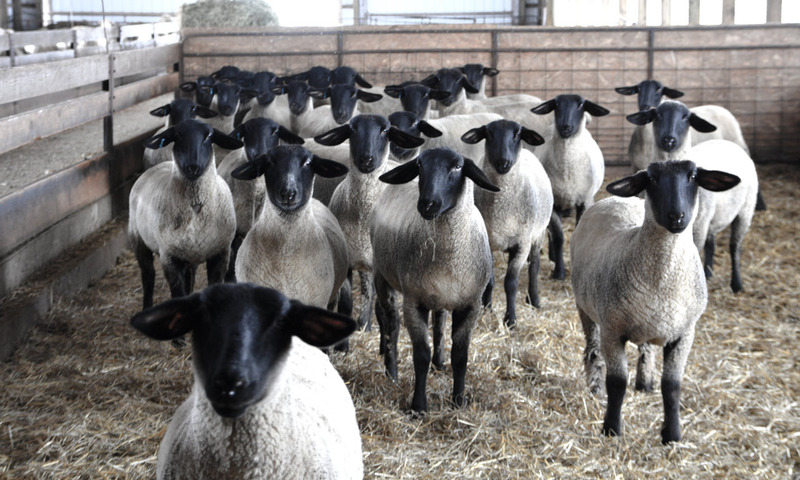 The Todds have a purebred flock (150 ewes) and commercial flock (350 ewes), breeding Southdown and Suffolk sheep and mixing in Rideau and Isle de France. A third generation sheep farmer, Keith has also experimented with milking sheep in the years 2005 to 2010. An accident made it difficult for Keith to do the milking and when sheep milk prices didn’t keep up with the cost of production, he returned to meat sheep with a focus on superior genetics. The Todds make use of genetics from Australia to add more muscle to their sheep to increase carcass yields as well as improve the hardiness of the sheep. “Their (Australia’s) numbers gives them access to technology and their genetics have progressed that much faster,” says Keith. Here in Canada, where sheep numbers sit around one million, many sheep farmers are hobbyists. However, sheep farming can be a professional and profitable occupation. “It’s important to maintain a high standard of health and genetics,” says Keith. The Genovis award for Highest Flock Improvement recognizes the flock with the greatest overall improvement in genetic indexes. The Todds are paying special attention to their Southdown sheep genetics. Once considered a breed with great maternal instincts but slow-growing, genetics have changed the breed into a larger, more productive animal with excellent temperament. Using these qualities, Todd has partnered with a processor in Hamilton to create a “Certified Southdown” brand to market his Southdown lambs. Describing the meat as more marbled, with finer texture and higher eating quality, Keith is excited about the options this new partnership can create. As they sell Southdown rams to new and genetic-focused sheep producers, Keith mentors the farmers to develop a consistent product. Todd Sheep company rams start at $850 and this year’s winning Southdown rams are selling for over $2,000. Adding to the year’s success for the Todd Sheep Company was the excellent showing at the Royal Winter Fair. Along with the Premier Breeder banner, they also won Supreme Get of Sire (three animals from one ram). Hugh, Keith and Keith’s three daughters Lauren, Megan and Reese attended the event with Lauren taking championship honours in the Junior Sheep Show.